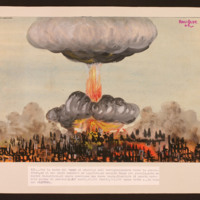 A mushroom cloud is prominent in the top of the painting with a smaller cloud lower down on a pillar of flame. Below that is a scene of mass devastation. Buildings are engulfed in flames and a mushroom-shaped cloud of smoke and fire starts to expand over the town. Mass devastation is visible. Buildings and people (visible as stick figures at the bottom of the image) are engulfed in flames as a column of fire and smoke rises into the sky. Atomic bombings of Hiroshima and Nagasaki. Part 3. 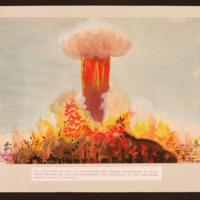 While fire is engulfing the town, a mushroom-shaped fire-ball and smoke rise into the sky. An enormous fireball is expanding above a built-up area, surrounded by rings of smoke. Building are destroyed and lattice structures have been thrown up in the air. 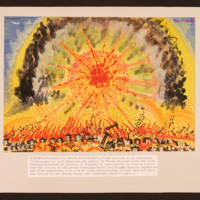 An enormous explosion is occurring above a built-up area. Buildings are destroyed and lattice structures have been thrown into the air.